Voxal Voice Changer Software makes chatting online, preparing audio for presentations or playing a game even more fun. Easily modify and disguise your voice in any application that uses a microphone. This video covers all of the basics you need to navigate Voxal, preview voice effects, create custom voice effects, record voices or apply a voice effect to a recording. This tutorial shows you how to synthesize text to audio. It's easy to import text, apply a voice effect and save your new audio file. This tutorial will show you how to temporarily switch back to your normal voice while using Voxal with the "Bypass" tool. Note: the tutorials on this page are for Voxal beginning with version 1.32. For tutorials on other NCH Software products see the NCH Software YouTube Channel. 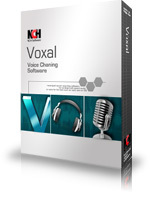 Voxal Voice Changing Software is fun and easy to use. It's the perfect tool to add voice effects when chatting online, playing interactive games online, or making a recording.